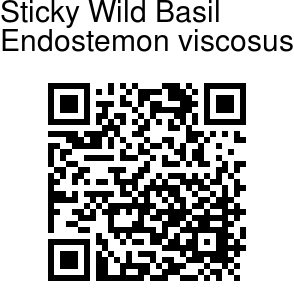 Sticky Wild Basil is a subshrub, growing from a woody base. Branchlets are finely velvet-hairy, 4-angled, becoming round later. Leaves are decussate, elliptic to nearly round, up to 2 x 1.5 cm, densely velvet-hairy below, base flat, margin rounded toothed, tip blunt; leaf-stalk to 1 cm. Flowers are borne in whorls of 6, on a 3-chotomous raceme at branch ends. Flower-cluster-stalk are up to 9 cm, bracts ovate; flower-stalk 0.5 cm. Calyx-tube is hairy within, limb 2-lipped, 1 + 4; upper lip ovate-nearly round, 1.5 cm; lower mid (2) lobes longer, lanceshaped, hairy outside. Flowers are pinkish, 4.5 x 2.5 cm wide; tube 3 mm; limb 2-lipped, 4 + 1; upper lip ovate, 3 mm; lower lip 3.5 mm, hairy along throat. Stamens 4, didynamous, descending into lower lip; filaments 2 mm; anthers 2-celled. Disk anteriorly developed. Nutlets are erect, enclosed in accrescent calyx. 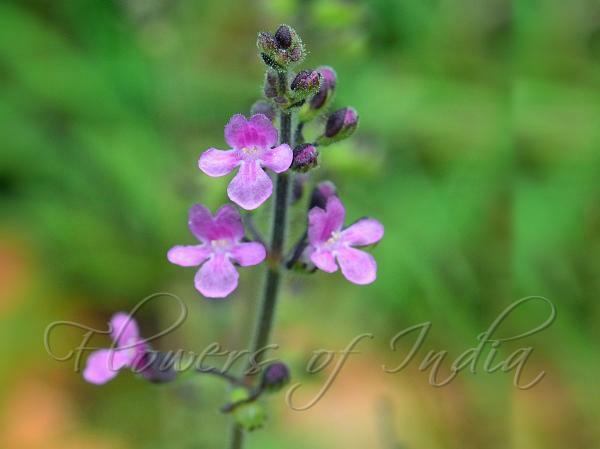 Sticky Wild Basil is found in South India and Sri Lanka. Medicinal uses: In folks medicine, to increase fertility in women, fresh leaves are ground with Oryza sativa and the extract is drunk after menses. Identification credit: Anurag Sharma Photographed at Gundumgere, Doddaballapura, Karnataka.